On the morning of April 2, Samantha Whitney Jones found R.J., her 11-week-old baby boy, dead in his bassinet. According to an autopsy, the cause of death was a combination of methadone, amphetamines, and methamphetamines. Jones, a person in recovery, takes methadone on a daily basis to treat her opioid addiction — a treatment that is recommended for breast-feeding mothers. That night, around 3 a.m. she breastfed R.J. because she was just too tired to make a bottle of formula. Jones was charged with criminal homicide. Her bail: $3 million. A judge later decreased the bail to $500,000. In the heart of our criminal justice system is an inherent urge to be as punitive as possible. To achieve true reform that reverses the trend of mass incarceration, we must push against injustices in every case – regardless of how tragic that case may be. The Eighth Amendment protects against "excessive bail." It is hard to see how the bail set in this case does not fall under that category. Marni Snyder, a criminal defense attorney practicing in Philadelphia, explains that the amount of bail "is really supposed to be whether a person is a danger to the community and whether they are a flight risk, but often they are considered a flight risk because of how serious the allegations are." The allegations against Jones are very serious. Does that automatically make her a flight risk? Jones is a grieving mother who just lost her baby under terrible circumstances. Perhaps she has criminal responsibility, but a $3 million or even $500,000 bail is as good as holding her with no bail at all. Jones shouted to her mother who lives with her when she saw that something was wrong with R.J. He was rushed to the hospital. The criminal complaint does not indicate any lack of cooperation from Jones. Nothing that we know so far about the case suggests that she is a flight risk. Perhaps the bail is so high because Jones is a danger to society. After all, she is charged with criminal homicide. "If the crime is really upsetting, all of a sudden they are considered a danger to the community, without looking whether or not their crime is likely to be repeated on the street," Snyder explains. According to the criminal complaint, the physician that performed R.J.'s autopsy "advised [that] R.J. ingested the combination of fatal drugs through breast milk." In addition to the high bail, the judge imposed a condition that Jones will not come in contact with anyone under the age of 18. What is the judge scared of, that Jones will breast-feed teenagers after using drugs? It seems improbable, if not impossible, that Jones would be able to repeat the alleged crime. >> READ MORE: Breastfeeding is best for babies, but what about their sleep-deprived parents? Why the high bail then? Snyder says that often the official setting the bail – which could be a judge, magistrate, or commissioner depending on the court — "uses their gut reaction to the crime to set a high bail to make a statement about how upsetting the offense is, and that is not right." 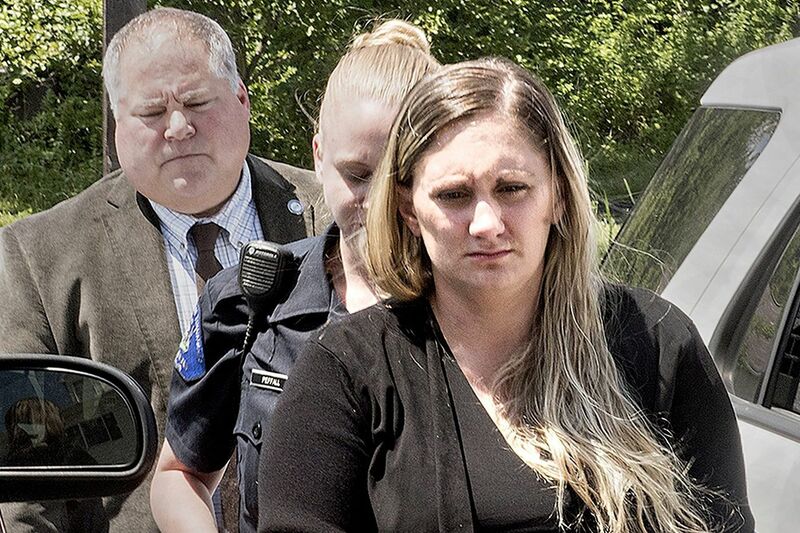 A mother struggling with addiction, less than three months after giving birth, who lost her child a bit over a month ago is now incarcerated while she awaits trial because of a gut reaction to a devastating tragedy. She won't be able to tend to her 2-year-old son or grieve the death of her newborn because of a judge's need to be punitive. Every day hundreds of thousands of people, mainly poor people of color, are incarcerated before trial because they can't make bail. Many of those people are not a risk to society or at risk to not appear in court. Being held in pretrial detention is associated with longer sentences and increased probability of re-offending. Justice doesn't require sympathy. You don't need to feel for Jones. However, if you believe that excessive cash bail is unjust, you should advocate for Jones even though she might be found criminally responsible for the death of her baby. Justice and due process should not be limited to defendants in nonviolent cases or cases that don't make our stomach turn. The Bucks County prosecutor handling the case said that, "This is a sad and tragic example of the opioid crisis that's affecting Bucks County." If that is true, the case should be handled with the larger context in mind. An initial $3 million bail makes it clear that there is one person to blame here — Samantha Whitney Jones. In reality, there is a whole system that led to the premature end of R.J.'s life. Even in the saddest cases we need to demand justice. Allowing Jones to grieve the death of her son while being with family as she awaits her trial is the just way to handle the case.